DEDICATION: In Memory of Stacie Alexander Fallon. 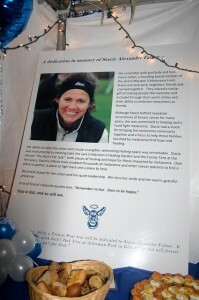 We remember with gratitude and love, Stacie Fallon, a founding Board Member of the Jack H Marston II Melanoma Fund. Stacie and Jack were neighbors, friends and coached together. They shared a similar gift of making peop le feel welcome and included through their warm smiles and their ability to embrace newcomers as friends. Although Stacie battled repeated recurrences of breast cancer for many years, she was committed to helping Jackʼs Fund fight mel anoma. Stacie had a vision for bringing the melanoma community together and a focus to help those families touched by melanoma find hope and healing. Her ability to take this vision and create a tangible, welcoming healing space was remarkable. 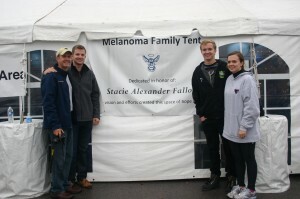 Stacie was instrumental in creating both the Jack H Marston II Healing Garden and the Family Tent at the annual “This Runʼs For Jack”, both places of healing and hope for those impacted by melanoma. Over the years, Stacieʼs efforts have enabled thousands of melanoma and other cancer patients to find a place to gather, a place to fight back and a place to heal. We thank Stacie for her vision and her quiet leadership. We miss her smile and her warm, graceful presence. One of Stacieʼs favorite quotes was, “Remember to live. Dare to be happy.” Stacie did, and so will we.